Coke is not only a refreshing fizzy drink, it's quite a nice marinade for meat. Many people are familiar with ham cooked in Coke, famously introduced by Nigella few years back. There are also Chinese recipes related to Coca-cola. When getting a cold, many like a hot flat ginger-lemon-Coke 薑檸樂, a lovely drink and quite an effective cure. Coke is really nice to go with ribs, pork chops and chicken wings recipes Chinese style. Coke wings are lovely, a favourite with many Chinese especially children. The sweet dark and spicy sauce coated on chicken wings is sticky fingers licking good. 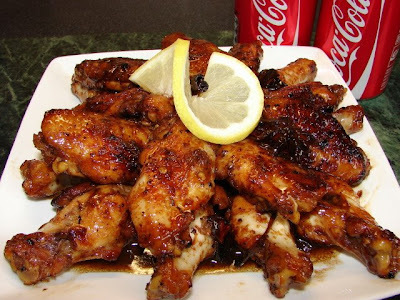 The recipe is really simple, just chicken wings, Coke, few spices, soy sauce and cooking wine. Cut wings into sections. Marinate with soy and wine for few hours, turning few times during marination. Drain off marinade. I don't like to use this marinade for the sauce, it draws out juice/impurity from the meat and makes the sauce cloudy. 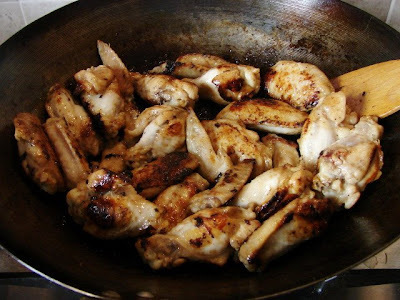 Fry the wings without oil till golden brown all sides. Set aside. Bashed the garlic, no need to chop. Slice the spring onion. Ginger no need to peel just sliced. 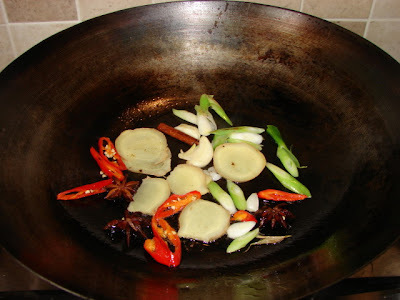 Clean wok, heat oil then fry the spices till fragrant. Add in the Coke and the rest of the ingredients let this bring to the boil, then add in the chicken wings. 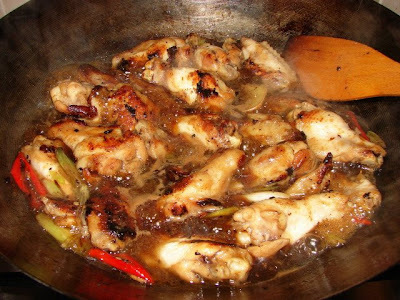 When the liquid starts boiling simmer at medium high heat till the liquid is reduced to a thick and syrupy sauce coating the chicken pieces. Stirring more when the liquid is drying up. If you like a zingy taste you can add in some lemon/lime juice towards the end of the cooking. Hi there! Made this today ... with 7-up (didn't have coca-cola at home). Came out really good. I added more star anise and cinnammon (just bcos I love those spices) & I added 1 onion (julienne). Thanks for the recipe. I had my reservation about the flavour, but I am glad I tried it. Will definately make again, since my 4.5 yr old liked it! Glad you like it. Never thought of using 7 up. I had only used 7 up for steamed sponge. Hi, I'm lucky enough to live in HK now and have this dish quite often when working in the mainland, so I thought i would try it myself. I didn't have quite the right ingredients, but despite this all worked out great. I finished the lot myself.